The 2nd Moo Duk Kwan Shim Sa. Seated from left; Hee Suk Choi(5), Hong Ju Kang(8), Jin Tae Hwang(11), Joong Song Kim(6), Yong Bom Won(14), Unknowen. 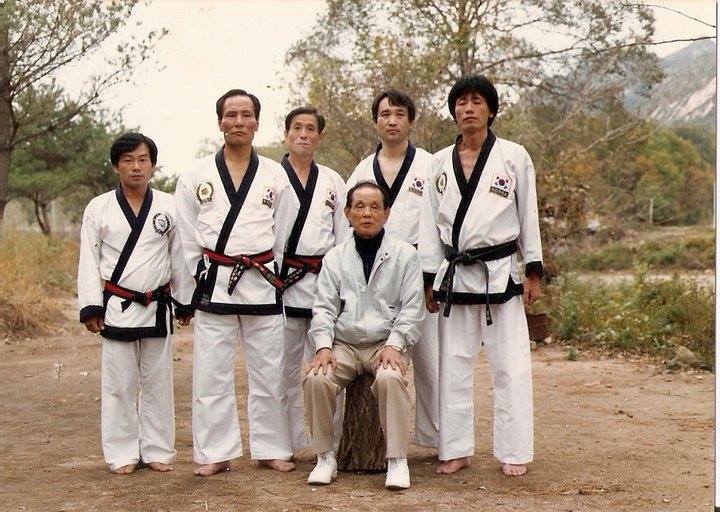 The 2nd role with from wearing Do Bahk; Jong Myung Hyun(Chong Do Kwan), Suk Hong Kang(16), Unknown, Unknown, Jong Soo Hong(10), Bok Song Park, Byung Jik No(Founder of Song Moo Kwan), Won Kuk Lee(Founder of Chung Do Kwan), Kee Hwang(Founder of Moo Duk Kwan), Yuk Sam Hwang, Unknown, Hwa Yong Yu(3), Woon Chang Kim(1). The third role; Chang Yong Chung(15) who had a head band, Myung Soon Lim(20) who stand behind Byung Jik No, In Suk Kim(12) who is stand behind Won Kuk Lee, Yong Duk Kim(2) who is stand behind Wha Yong Yu. 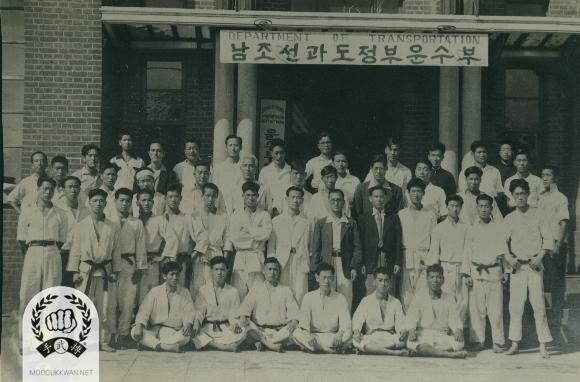 Above sign read “Department of Transportation of the South Cho Sun Interim Goverment”. With great sadness we humbly announce the passing of Master Kim, Yong Duk, Dan Number 2. Master Kim, Yong Duk was one of Grandmaster Hwang Kee’s original students. He is pictured below standing second from left. This announcement was posted on the internet. I am very sorry to learn about Kim, Yong Duk Sa Bom Nim’s passing. My thoughts are with him and his family. It was very good visit with him last October when he was in the hospital and we shared many stories and thoughts of the past and present of the Moo Duk Kwan. He was going to attend the Moo Duk Kwan 70th next year. I have good memories of him during early days of the Moo Duk Kwan. 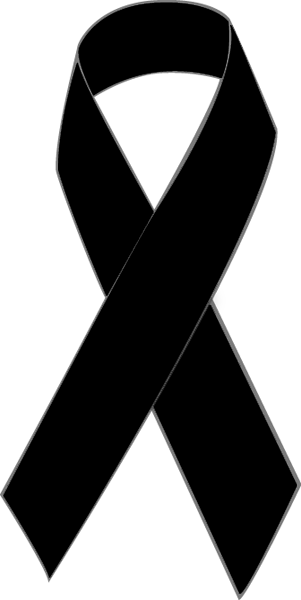 I hope all Moo Duk Kwan practitioners join me to wish his peaceful rest.